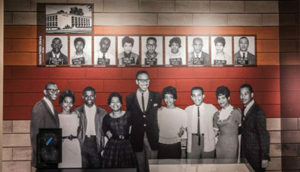 The Mississippi Civil Rights Museum tells the stories of Mississippi residents that made extraordinary contributions to the Civil Rights Movement. In the early morning hours of January 10, 1966, civil rights leader Vernon Dahmer Sr. was jolted from his sleep, as members of the Ku Klux Klan surrounded his house just north of Hattiesburg, Miss. Dahmer, a Black landowner, had been actively working to register Blacks to vote and, in some cases, he even paid their “poll” taxes. It was enough to earn a Black man a death sentence in the South. The Mississippi Civil Rights Museum opened on December 9, 2017. The Clarion Ledger re-ported that the Dahmer family donated a truck that had been shot during the 1966 attack to the Mississippi CivilRights Museum. Each museum gallery high-lights a specific sub-topic or period. Gallery 1 defines civil and human rights; Gallery 2 focuses on the Civil War and Reconstruction; Gallery 3 highlights civil rights activists and shares the stories of a Mississippi movement that changed the world; Gallery 4 peels back the layers of a segregated society; Gallery 5 showcases the sacrifices and the successes of the 1960s; Gallery 6 takes a deep dive into the Freedom Summer and local movements in Mississippi (1963-1964); and Gallery 7 tells the story of Black Empowerment from 1965 to the early 1970s.